Pinoy President Rodrigo Duterte has praised Russia and China for providing arms for his forces to use in their struggle against Islamist rebels in the south of the Phillipines (archived). The Phillipines has until recently aligned itself strongly with the US, but relations have soured as the Great Again free USG State Department has worked to thwart Duterte's efforts to try making the Pinoys great. Duterte further aired his concerns that the USG.CIA with its own anti-Great faction may move to assassinate him. Today Airstrip One's Porton Down defense laboratory admits it has no evidence to support loud Pantsuit allegations that the nerve agent used to poison a British double-agent came from Russia (archived). This news comes despite the government of the not so United Kingdom using the incident to blow up relations with Russia while fishing for solidarity with the continental Europeans whose Union the Brits will be leaving. Despite the usual pantsuit media organs insisting Russia must have done it, the ready baked pantsuit public relations campaign accompanying the incident lacks an innocent look on its surface. El Gobierno de Ecuador suspendió de los sistemas que permiten a Julian Assange comunicarse con el exterior desde la embajada ecuatoriana en Londres, en donde el ciudadano permanece en situación de protección internacional desde hace seis años debido al riesgo que corre su vida e integridad. El Ejecutivo mantiene además abiena la vía a la adopción de nuevas medidas ante el incumplimiento del compromiso por parte de Assange. Today United States President Donald Trump captured headlines by making a rare medical condition a disqualifier for military service in the United States, as many other medical conditions already are. This relieves the Department of Defense from having to assume the substantial surgical and psychiatric care costs the US medical establishment has come to accept as standard for this condition. Various lamestream news outlets have offered different four and five figure numbers of currently serving military personnel standing to be affected by this policy change. In other events, Trump has managed to make Attorney General Jeff Sessions great again. Following more minutia supposedly exposed in the Russian collusion witch hunt, Trump appears to have ceased conferring with his Attorney General in private and begun communicating suggestions to his top law enforcement official exclusively through the media. In less than one week Jefferson Beauregard Sessions III has gone from the fake news industrial complex's whipping boy, a caricature of the "evil" Southern gentleman, to enjoying fawning fake news coverage as a beleaguered and sympathetic Southern gentleman. Only muted coverage in the fake news media has been given to the fact that since this change in communications channels, Attorney General Sessions appears to have been faithfully pursuing every instruction delivered to him by President Trump. Where the fake news media is reading animosity between the two, reality seems to be showing a very strong, public1 working relationship. As a bonus, the new structure of this relationship is bound to complicate the ongoing "Russian collusion" fanfic being authored by Jeff Bezos' Amazon Washington Post. It’s a move that, for the moment at least, seems like a rather misguided overcorrection. So far, no one has released any compelling evidence that Kaspersky is working with the Russian government to undermine the security of its millions of customers. It remains to be seen if this demand that evidence of Russian involvement with respect to Kaspersky Labs is an isolated incident, or if in their exhaustion the Washington Post company has joined other Fake News players in ceasing to care about intra-day narrative consistency. Lame duck United States President Hussein Bahamas has continued his new hobby of abruptly changing US policy as his term approaches its constitutional end. In addition to the mundane changes like telling Bibi off, opening the dollar printing press to agriculture, and converting a million acres in the American west into a "National Monument" on a whim Hussein Bahamas escalated his saber rattling with Russian President Putin. Hussein Bahamas is expelling 35 registered diplomats from the Russian Federation, giving them 72 hours to leave US soil while also denying access to and ordering the closure of Russian diplomatic compounds in New York and Maryland. This move is accompanied by other assorted sanctions. Pence in our time. A Russian passenger plane reportedly crashed over the Black Sea after refueling near Sochi en route to Syria for a Christmas celebration serving deployed troops (archived). Among the victims are Alexandrov Ensemble, the premier choir of the Russian armed services and humanitarian activist Elizaveta Glinka. Pieces of the Tu-154B-21 are being found ~1.5km out from the Black Sea coast at a depth of 50-70 meters. President Vladimir Putin has declared December 26th as a national day of mourning. 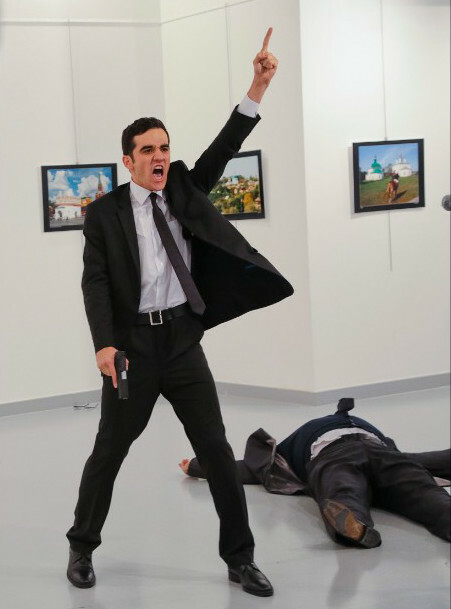 Today Russian Ambassador to Turkey Andrei Karlov was shot dead by an assassin at an art gallery in Ankara. The assassin is alleged to be a local police officer who during the killing praised the name of his higher power, one he chooses to call Allah. Due to the nature of the event a number of high quality photographs and videos of the attacker and the attack itself are circulating. There is no credible news on the identity Mevlüt Mert Altıntaş has been identified as the shooter and his fate is still unknown at this time suggesting he is still at large and possibly being supported in his evasion of justice is in custody. Two and a half miles away the United States embassy complex was shut down due to a "security incident". United States Lame Duck President Hussein Bahamas still enjoys a bit more than a month in office with which he can start a hot war with Russia.